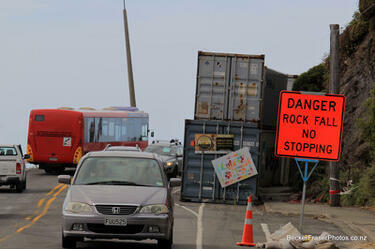 Photograph captioned by BeckerFraserPhotos, "Decorated containers, Main Road, Mt Pleasant". 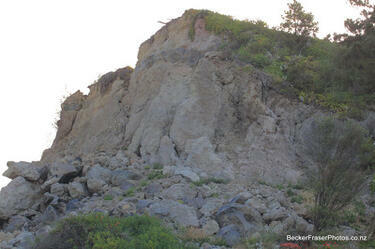 Photograph captioned by BeckerFraserPhotos, "Main Road, Mt Pleasant". 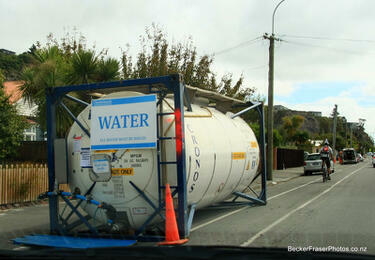 A water tank on Main Road in Redcliffs with a sign reading, "Water. 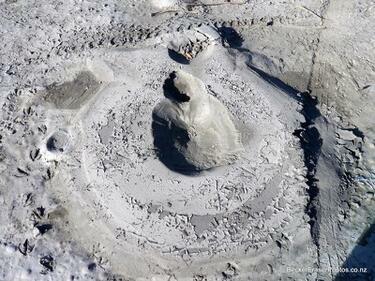 All water must be boiled". There is a smaller sign underneath reading, "Wash your hands". 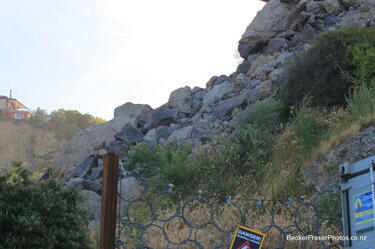 A photograph captioned by BeckerFraserPhotos, "Main Road, Redcliffs". 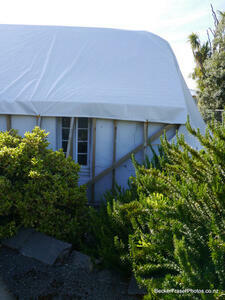 A photograph captioned by BeckerFraserPhotos, "The Sumner Cob Cottage on Main Road in Sumner". 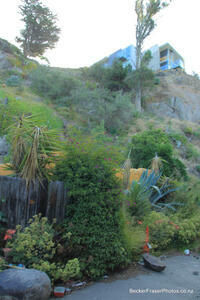 A photograph captioned by BeckerFraserPhotos, "The Cave House, well known for its bright colour, on Main Road in Redcliffs. 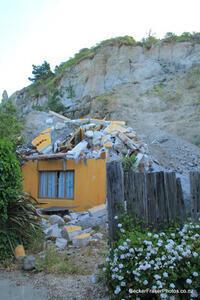 The house was further demolished by the most recent rock fall in the 23 December 2011 earthquake". 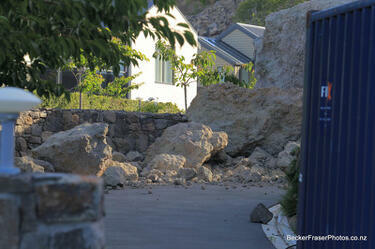 A photograph captioned by BeckerFraserPhotos, "A recent rock fall at Main Road in Redcliffs". 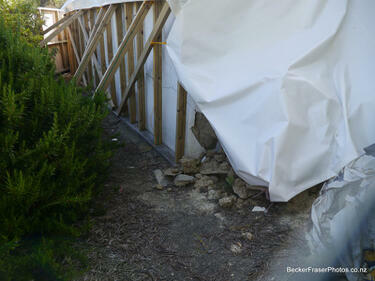 A photograph captioned by BeckerFraserPhotos, "The Cave House garage on Main Road in Redcliffs". 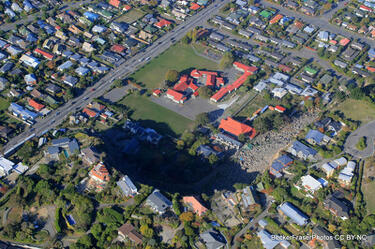 A photograph captioned by BeckerFraserPhotos, "Liquefaction covers the car park by the Sumner Cob Cottage". 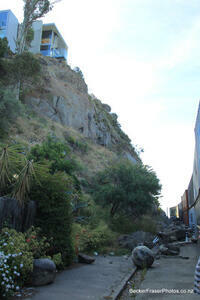 A photograph of fallen rocks behind a row of shipping containers on Main Road in Redcliffs. 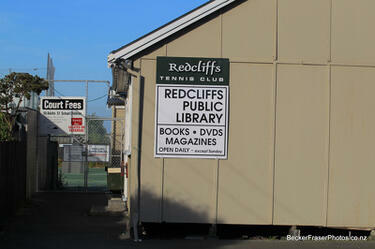 A photograph captioned by BeckerFraserPhotos, "The Redcliffs Community Library has moved to a new location where the Tennis Club was. 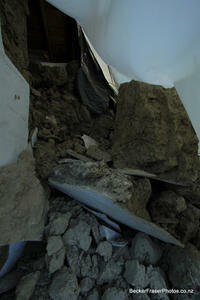 The courts are badly damaged". 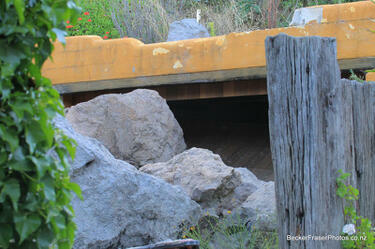 A photograph captioned by BeckerFraserPhotos, "The Sumner Cob Cottage on Main Road in Sumner. 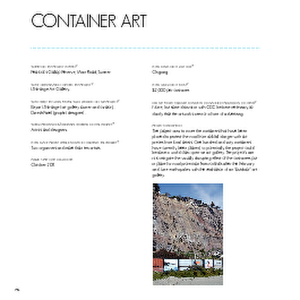 A video of an interview with Laurence Mote about the wall of containers in Sumner. 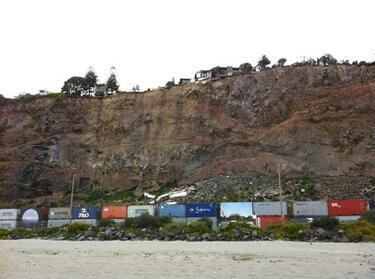 Shipping containers line the south side of Main Road in Sumner, protecting road users from potential rock fall from the cliffs above. Mote bikes past the containers every day on his way to work. 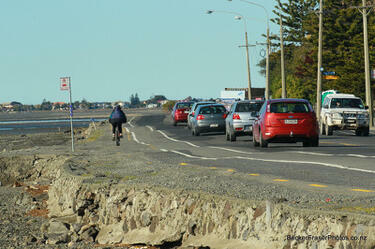 He talks about the risks facing cyclists along Main Road and in greater Christchurch, including pot holes and narrow roads. 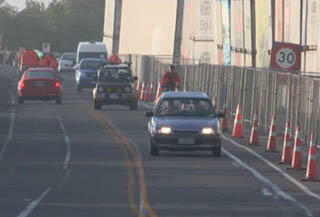 He advises cyclists to wear bright clothing and lights, and for cars to slow down and give cyclists room.